People go to the gym for endless reasons, but of those doing strength training, most have definite opinions about one thing: They want either lean, toned muscle or a built-up, bulky physique. While genetic factors do play a role in your muscular development, you can tailor your workout to favor the effects you're after. According to the American Council on Exercise, it's largely a myth that weight lifting doesn't cause women to bulk up. It is true, however, that the tendency to develop bulky or lean muscles varies widely from one person to the next. While the male hormone, testosterone, does contribute to muscle growth, body type is just as important a factor in how your body responds to strength training. If you have a muscular mesomorph body type, you'll quickly take on more muscle mass. If you're a more voluptuous endomorph, you'll typically lose weight before you see notable growth in muscle. Slim ectomorphs are unlikely to ever develop bulky muscles, even as they become stronger. In essence, you build up a muscle by overloading it. Strength training or aerobic exercise both create resistance, either with weights or body mass, which your muscles must work to overcome. When the resistance is sufficiently demanding, your muscle tissues respond by increasing in size and changing shape. 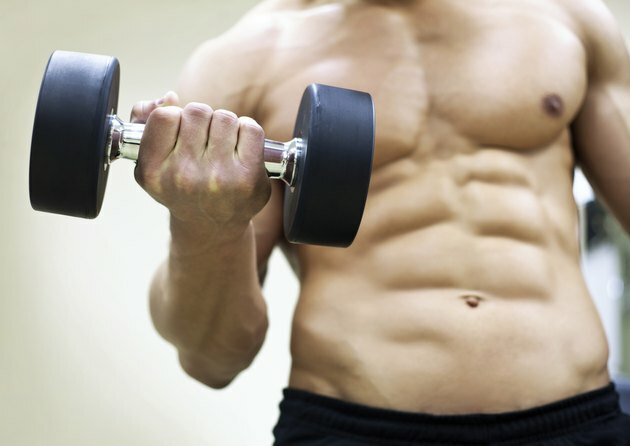 You can influence your muscular development by adjusting the amount of resistance as necessary. In addition, your diet influences muscle growth; eating plenty of carbohydrates provides your muscles with ample energy to heighten performance and development. If you want a physique that's toned but reasonably lean, take steps to inhibit massive muscle growth. You cannot control your body type, which largely determines your muscular development. However, you can adopt a workout with many repetitions of relatively low-resistance exercises. Pairing your strength training with aerobic exercise helps reduce body fat, giving you a leaner muscle-to-fat ratio and a more toned overall look. For lean muscle development, opt for relatively light endurance activities, such as long-distance running, instead of more explosive forms of exercise, such as shooting soccer balls during a match. If you want to develop the silhouette of a bodybuilder, adapt your training to include shorter bouts of higher-resistance exercises. Do strength training at least twice per week, but never train the same muscles two days in a row. For optimal development, muscles need 24 to 48 hours to recover, a crucial stage for growth. Select a weight that you can lift up to 12 times; the last repetition should be difficult but possible, leaving you unable to complete a 13th. As you progress, add on to your workout by including additional sets of 12 repetitions each. Build up to three sets of 12 reps during each training session. Meet with a qualified personal trainer or dietitian to ensure that you're consuming enough calories to provide energy for your workout and also repair and build your muscle tissue. Health Services at Columbia, Go Ask Alice! : How Do I Slim Down Bulky, Muscular Thighs? Health Services at Columbia, Go Ask Alice! : Do Bodybuilders and Other Weightlifters Need More Protein? Can Fat People Gain Muscle Faster Than Skinny People? How Much Muscle Can a Woman Gain With Strength Training? Do Calf Raises Make My Calves Bigger?